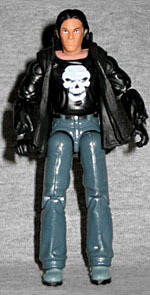 As part of their line of three-packs based on the GI Joe comics, Hasbro teamed with publisher Devil's Due to allow fans to vote on what figures they wanted to see. Previously, all the comic packs were based on the old Marvel books - this would be the first set from the new series. A Native American mystic warrior with a degree in psychology, Spirit Iron-Knife is also the best wilderness tracker on the GI Joe Team. He has an uncanny ability to find and read the faintest of trail signs and has a keen understanding of the human thinking process. This helps him not only find the Cobra forces he is tracking, but also anticipate their actions. He is a qualified expert with all the latest weapons systems available to the GI Joe Team, but does not depend on technology. In the field, equipped with just a knife, he can create his own weapons, as well as traps, snares, and deadfalls. As effective as these devices are, he still claims that the best weapons are psychological ones. 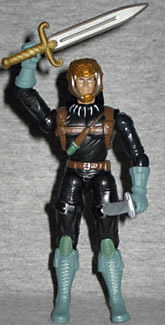 Spirit was never one of the most prominent Joes, but he was recognizable simply by being one of the many minorities on the team. The fact that he had a pet eagle helped, too. He got his first figure in 1984, but he's gotten a major makeover since then. He's dropped (most of) the stereotypical Indian elements, and is now looking extra-stealthy in his suave black bodysuit. The only holdouts are the fringe on his boots and the inexplicable necklace of teeth that's sculpted onto his chest. This figure is a repaint, but the source was only available once before, and then not even in stores. Spirit has traded in his twin braids for a more free-flowing hairstyle, which is kind of a shame. His face actually looks like a Native American's, rather than a white guy painted a different color. His only accessory is a big silver buck knife. Spirit is one of the characters whose name Hasbro lost over the years - that's why he's called "Spirit Iron-Knife" on the filecard. It's the GI Joe equivalent of calling an Alternator "Autobot Tracks." Interestingly, his real name - Charlie Iron Knife - is spelt without a hyphen. I guess that's what makes "Iron-Knife" a codename. Agent Krieger was a cover girl and fashion model in Chicago and New York prior to enlistment. She grew disillusioned with the shallow world of modeling and joined the military to take her life in a more meaningful direction. Now instead of being swathed in silk, she is covered in grease, and couldn't be happier. She is proficient in diesel mechanics and gas turbine technology, and can perform diagnostics, maintenance, and repair on any AFV that rolls into the vehicle bay, as well as fabricate new parts from scrap metal in the field. This glamour girl turned grease monkey is totally in her element talking about compression ratios and internal combustion over donuts and coffee. The only time she needs a stiletto heel is to loosen a rusty lug nut. Speaking of names, Agent Courtney Krieger is a doozy: none of her original codename is left. As hinted at on her filecard, she's better known as Cover Girl, a name Hasbro almost assuredly lost to the magazine. She was one of the three original GI Joe females, along with Scarlett and Lady Jaye, but she's nowhere near as familiar as those two. She's probably best known for being the only woman to ever give Shipwreck the time of day (outside of his insane fever dreams, of course). Cover Girl was only ever available with the Wolverine missile tank, and then only when it was in stores: when it was sold through mail-order, it didn't come with a driver. Getting this update of Cover Girl is very welcome, because she'd only ever had one figure before - 1983 and never again. Of course, given the limitations of the time, she didn't look very good, which certainly doesn't suit a character who used to be a model. This figure is a huge leap forward. She's wearing almost the same uniform as she was two decades ago, but it's gotten a slight update, and of course the sculpting is much better now. She actually looks pretty hot, aiming her little black pistol at Cobra forces. Hannibal is the genetic re-creation of the famous Carthaginian general who fought and almost defeated the Roman army. When Dr. Mindbender created Serpentor, gathering the DNA of history's most powerful military leaders, he included Hannibal in his genetic stew. The twisted doctor then went on to separately re-create each of these dead leaders. A brilliant tactician and daring general, Hannibal wants to achieve the task he set for himself centuries ago: liberate and conquer. Believing that the end always justifies the means, he will ruthlessly sacrifice vast numbers of his own troops, if necessary, to achieve his goal. The GI Joe Team represents all the enemies and detractors who thwarted him long ago, and he intends to repudiate his vision of glory by trampling them into the dust beneath his feet. Okay, bit of an error with that filecard, there. Dr. Mindbender didn't seperately re-constitute each of Serpentor's component parts - he made multiple Serpentor clones, in case something should happen to the first one. He just named them after the component parts. "Hannibal: Reborn" (as the filecard calls him) will grow up to be Serpentor, not Hannibal; the name was just a gimmick. It's a minor difference, but an important one. Hannibal is a surly teen, so he dresses like one: loose jeans, black jacket, shirt with a skull on it. You know, the "angry rebellion" uniform. Of course, with the forces of Cobra behind him, he probably has a better chance of pulling it off. The figure is an entirely new sculpt, though his coat tends to make him hunch over. To avoid that, make sure you've got his hair outside his collar; it really makes a difference. Though Hannibal doesn't really have any accessories of his own, there is one more included in the set. It's a five-piece shrine to Serpentor. There's a coiled cobra base, a removable sword and a clear dome covering Serpy's modern, technological helmet. It's a very cool piece, even if the helmet is too small to fit most figures' heads. Spirit, oddly enough, can wear it. Are they telling us he's the reincarnation of the evil Cobra emperor? 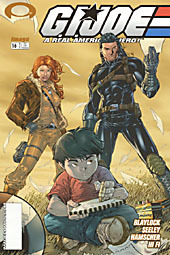 This set includes a reprint of GI Joe #16, as chosen by the fans. The story introduces Hannibal, and features Spirit and Cover Girl heavily, so it's a wonderful choice. Unlike the reprint Marvel comics, which have had all references to the House of Ideas carefully stripped out, this one still has all the Image and Devil's Due indicia - probably because DD still has the rights, whereas Marvel doesn't. The fans really made a good choice when it came to this three-pack: it includes one figure mold that's only been released once before, one character who only ever had one figure 23 years before, and one figure that's new from the ground up. That's a fine assortment! This one is definitely worth tracking down.